The top ten creative reuses of the orange bin as selected by the judges are shown below. Many of the 89 entries in the “creative category,” were extremely imaginative! The judges had the difficult task of diligently reviewing each entry to select these finalists. Remember, these are our friends and neighbors of all ages who submitted these ideas. We welcome constructive, respectful and positive comments if you wish to post. 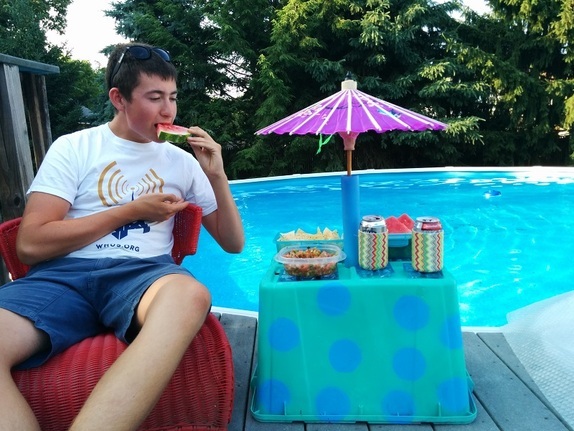 Introducing the poolside snack bar. Keep your munchies cool on the hottest of summer days with removable gel ice packs and interlocking containers which fit into the original grooves of the bin. But wait there's more! The parasol also shades the snacks further keeping them cool. Click here to vote for this idea! Super awesome idea Suzanne! I love the polka dots too! Love the idea! Polka dots too! The guy looks like he's really enjoying a snack by the pool!!! This would be great for those hot summer days. Good way to keep those cold ones handy! Now I just wish I had a pool. . .great idea. Easy to store or use off-season too! Come and bring your invention down to my pool anytime! Great job! Practical as well as creative! Use the bin to carry all the goodies out to the pool in one trip! I love everything about this entry - fun paint job w the circles, umbrella is a riot (and useful too), the cooling trays… genius! The photo and copy are perfect. Smart, simple and whimsical, you should design for IKEA!